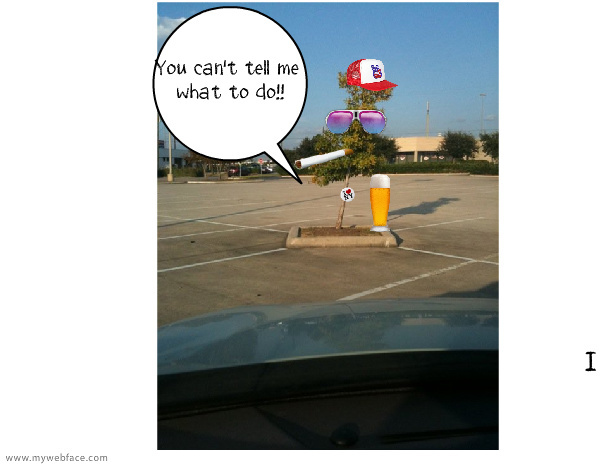 You are at:HomeUncategorizedHelp me get rid of this blasted tree! Help me get rid of this blasted tree! Are you supplyin’ the Marlboros? The beer? I never post on the weekend, but this tree got me so upset, I had to post. I am starting a petition to get this tree chopped down RIGHT HERE in the Break Room. It is obnoxious and is absolutely a fire hazard, not to mention a bad influence for the children. I see him every time I go to Target. I used to feel sorry for him because he was all alone in the parking lot, but now? Now I want to chop down his sorry behind. All he does is smoke and cuss all day and put our community at risk for a wildfire. The ashes he flicks on the parking lot are another thing that CHAPS MAH HIDE! Have you ever seen the amount of ashes a tree-sized cigarette can produce?? Guess what cleans up that mess? YOUR TAX DOLLARS! He doesn’t even have a job to pay for his dang cigarettes (not to mention legs to go and buy them. Someone’s supplyin’ ’em and, believe me, I’mma find out who!). If you care about the safety and welfare of the children, will you PLEASE sign my petition to help clean up our parking lots? Just write your name down in that comment section below and help me get that tree either chopped down or moved to another part of town. If you aren’t doing it for you, at least do it for the kiiiiiiiiiiiiiiiids!!!!!!! !